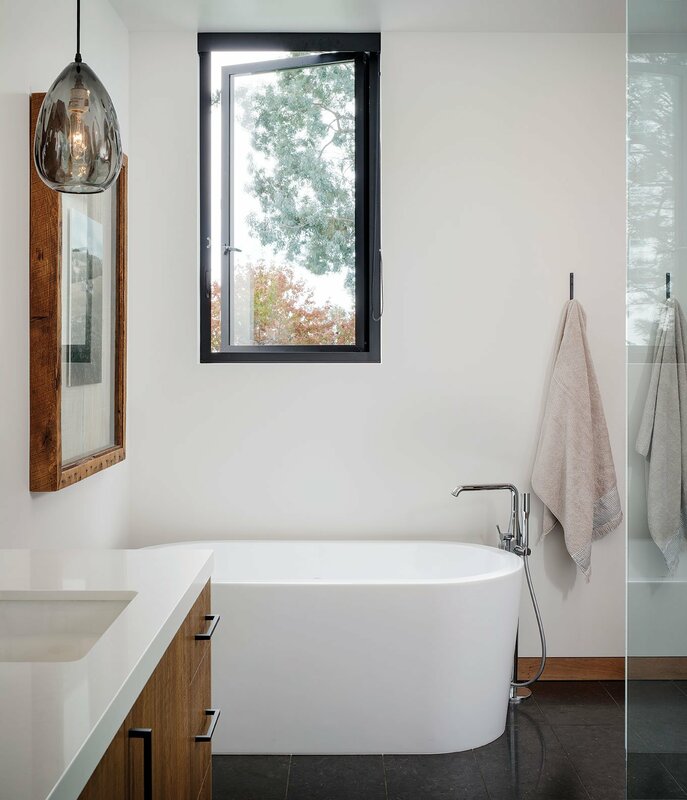 The wood cladding that Erica and John DeLorme researched and selected was almost too dark for Erica’s taste when it was first installed. but because they’re leaving it untreated, each board will naturally age to a beautiful platinum gray shade. Erica DeLorme and her now 17-year-old daughter Kyle had only been in Cardiff for 30 minutes when Erica called her husband John to tell him she was pretty sure she’d found their forever home. 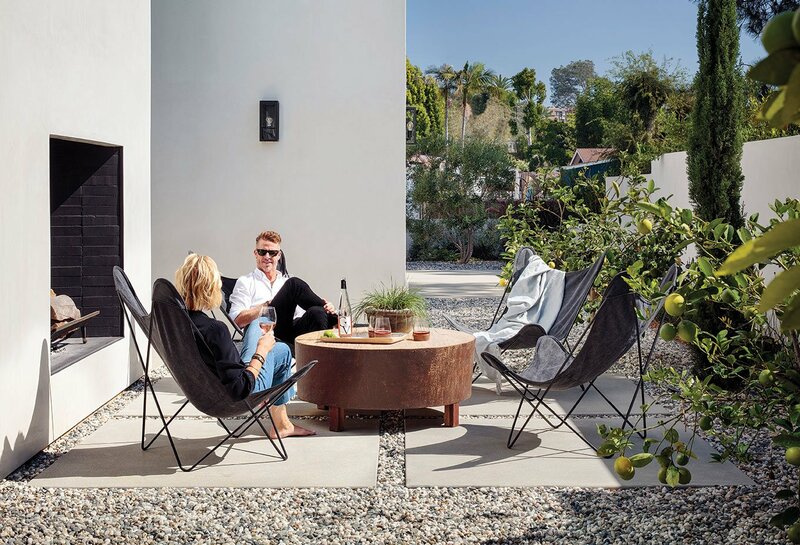 The couple always had hopes of one day moving from their Newport Beach home and retiring in Cardiff. John, a pediatric dentist with a practice in Mission Viejo, fell in love with the North County beach community in the ’90s when he lived there post residency—and surfed every second of his free time. Erica, originally from Anaheim, graduated from the University of San Diego, and adored Cardiff too. It’s rare that the whole family is home at the same time since all three teens have busy soccer schedules. “We started talking more about when we’d move, and we thought, ‘Why wait?’” Erica explains. “We had a small window of opportunity to move before Kyle started high school.” Erica and John didn’t want to relocate their daughter or two boys (Hudson, now 15; and Garrett, now 13) once they began high school. So, the couple started searching online for homes in the neighborhoods west of Interstate 5 and north of Birmingham Drive. But during that on-a-whim trip Erica and Kyle took just to look around, see the area high schools and scope out some streets, Erica spotted a corner house with a “Coming Soon” sign in the front yard. The DeLormes put an offer in soon after, then found themselves in a bidding war. In the end, they prevailed victorious because they were willing to remove all contingencies. There were no criteria that needed to be met since they were razing the property and starting new. The original nearly 1,600-square-foot, three-bedroom, two-bath home showed signs of termite damage, didn’t fully utilize the 9,500-square-foot corner lot and simply wasn’t big enough for the family of five. Kyle’s room has the best view in the house: On clear days you can see all the way down to La Jolla. Instead of typical single- and double-hung windows, architect Trace Wilson advocated for casement windows that open to “look like shark fins coming off the side of the house. Its’s just a nice modern detail,” the architect explains. 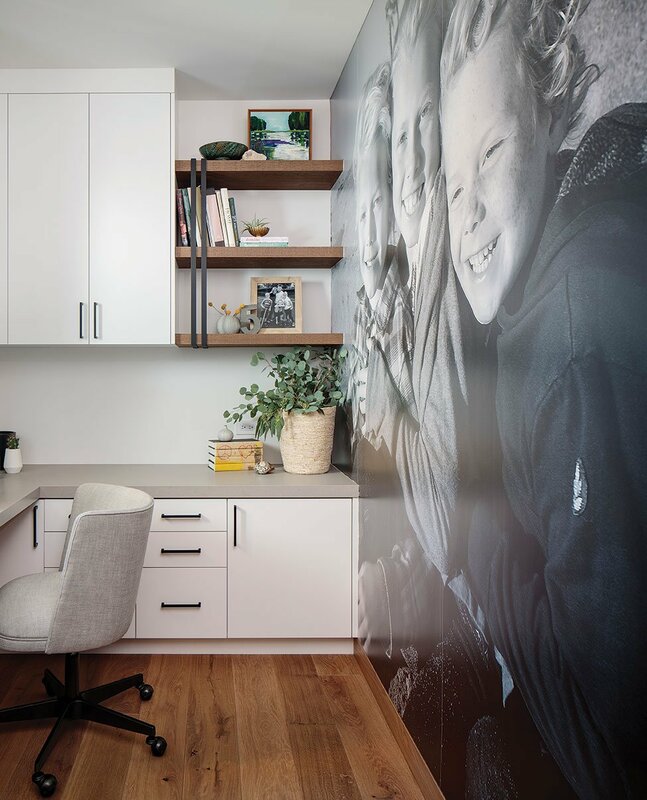 “I envisioned having the house that our kids would bring their friends to and, eventually, where they would come and stay with their own families one day,” she says. Erica created a gallery wall of family snapshots in the corner of the media room, where the kids play video games. 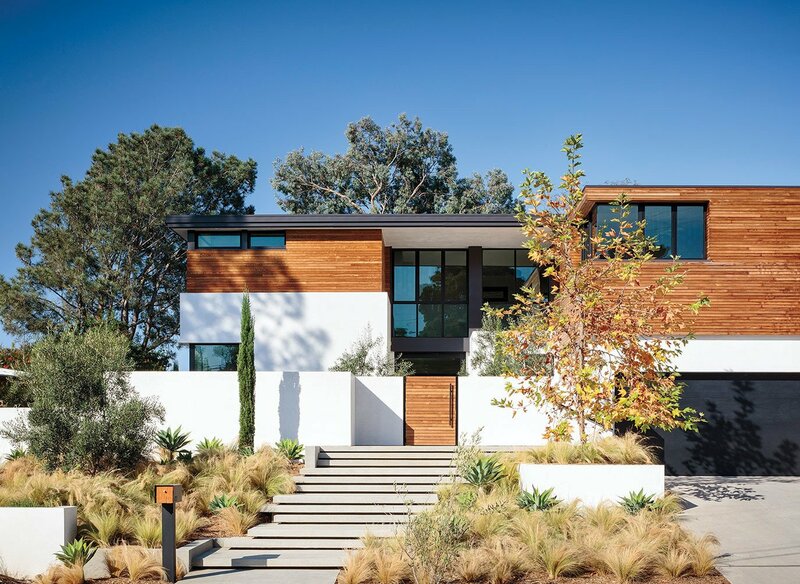 Erica and John hired Trace Wilson, principal architect at Materia, to help them build a modern home that maximized the lot’s potential, included an indoor-outdoor living concept, took advantage of the home’s location near the beach, provided enough space for their children and their friends, and had separate office spaces for Erica and John—and it all needed to be done on a tight budget. 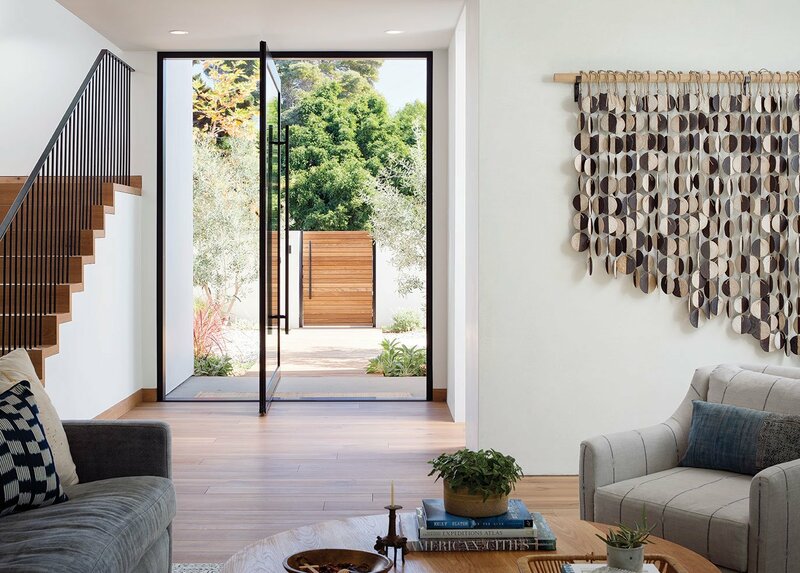 Erica discovered Michelle Quan’s three-dimensional work in one of her favorite shops in Newport Beach and asked the artist to make this piece for her living room wall. Trace’s original design called for a subterranean garage and an office for John with a separate entrance, but modifications had to be made. “The house was just getting too big at one point,” Erica admits. So Trace tweaked a few things and came up with a rendering of what stands on the property now. To fill the space, Trace set the house back from the street on the elevated lot. Where the original property’s front was just a lot of stone—a humongous, sloped driveway and steps up to the front door—Trace conceived a plan to bring the DeLorme’s visitors up concrete steps to a wooden privacy gate that leads into the wrap-around courtyard, which travels from the front, to the side and around to the back of the house. 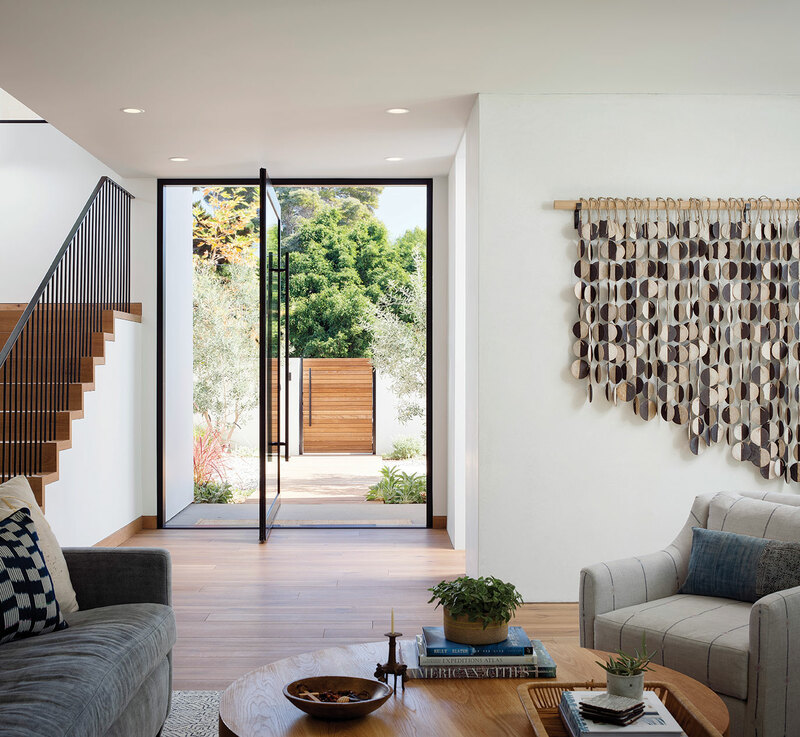 At the front yard, the home’s big entry door pivots open, offering views straight through the house to the backyard via a wall of sliding glass doors. John and Erica enjoy a glass of rosé on the side patio. The fireplace shares a wall with their fireplace inside that’s etched with “2018,” the year the home was completed. Besides the wall of sliding glass doors off the main kitchen and dining space (which mimic the outdoor kitchen, dining and seating area), the corner media room’s glass doors disappear so the kids can watch TV and play video games inside or challenge each other to a Ping-Pong tournament outside, on the table they got last Christmas. 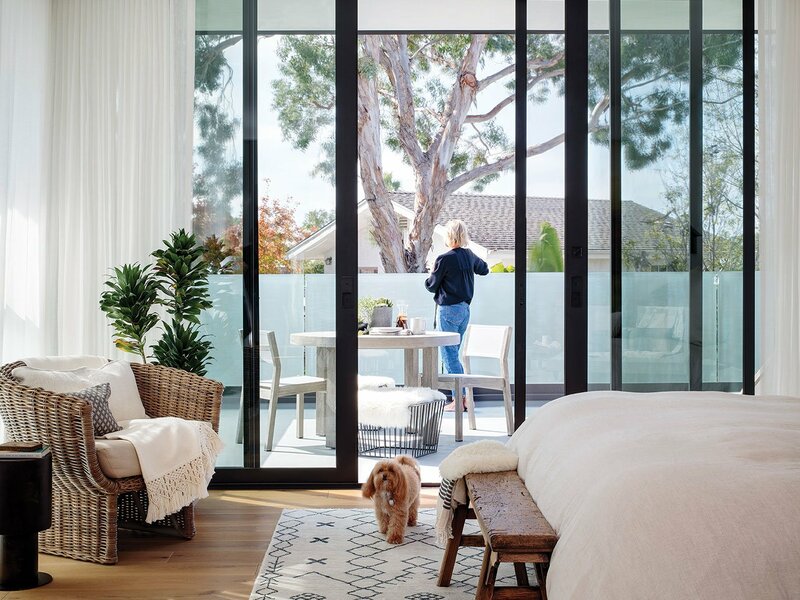 In the upstairs master bedroom, Trace continued the indoor-outdoor experience by employing a wall of sliding glass doors that go out to the generous-size private deck he designed. With peekaboo ocean views, the deck provides Erica and John with a pleasant spot to enjoy a cup of coffee, read a book or simply lounge. 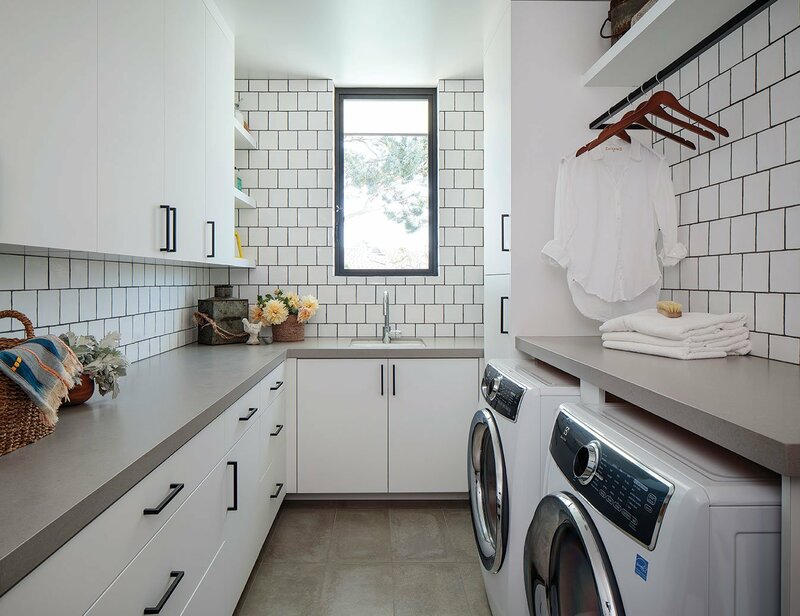 Erica picked the square tiles for the laundry room walls long before she knew what the room’s layout would look like. Trace also talked the DeLormes into floor-to-ceiling windows in the front of the house (the lower half of which are frosted for privacy) because he’s a huge proponent of cross ventilation. Erica added the window seat next to the fireplace to take advantage of the corner windows. Aside from the usual holdups with permits and city regulations (such as tricky height limitations), the project took 13 months to complete. 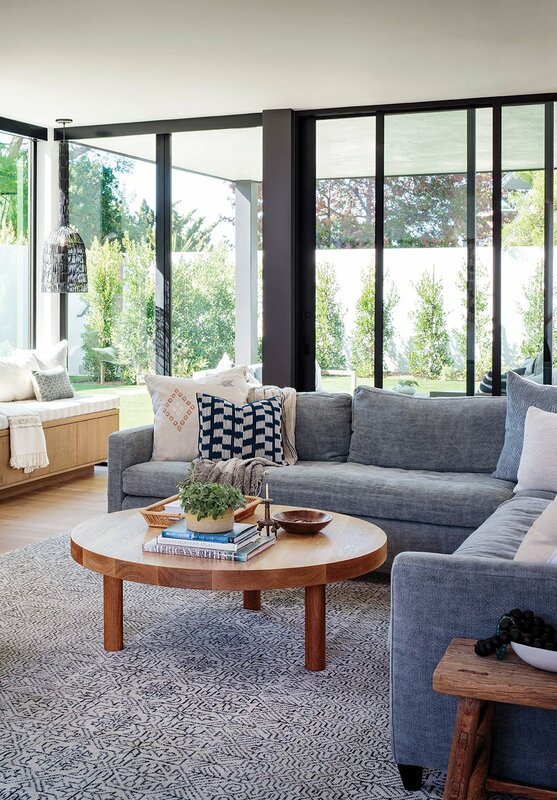 It helped that contractor Kerry Rutherford of KR Building, was only working on this home at the time; and that Erica, who runs E+D Designs (her interior design business), served as the project manager. She came with a binder of ideas and made decisions about materials, finishes, hardware and lighting long before the items were needed. 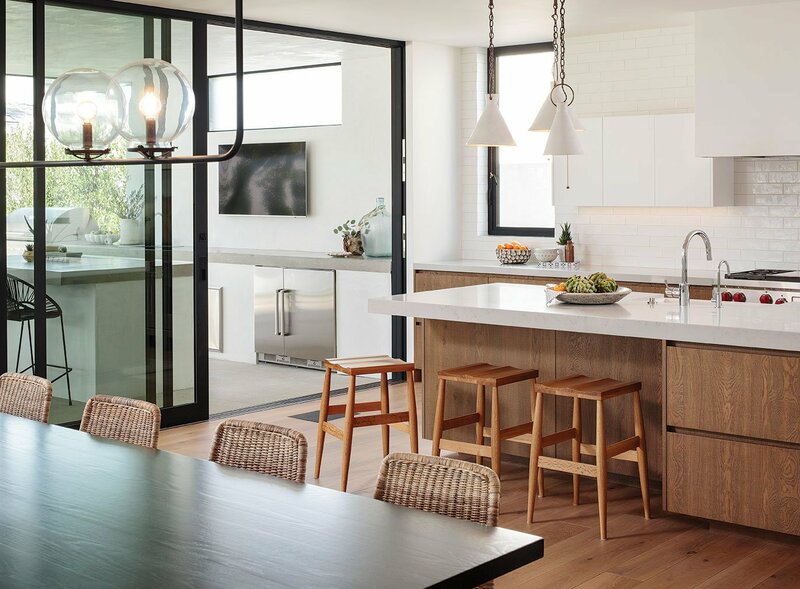 “I picked the trio of pendants above the kitchen island before the house was even framed,” she says. 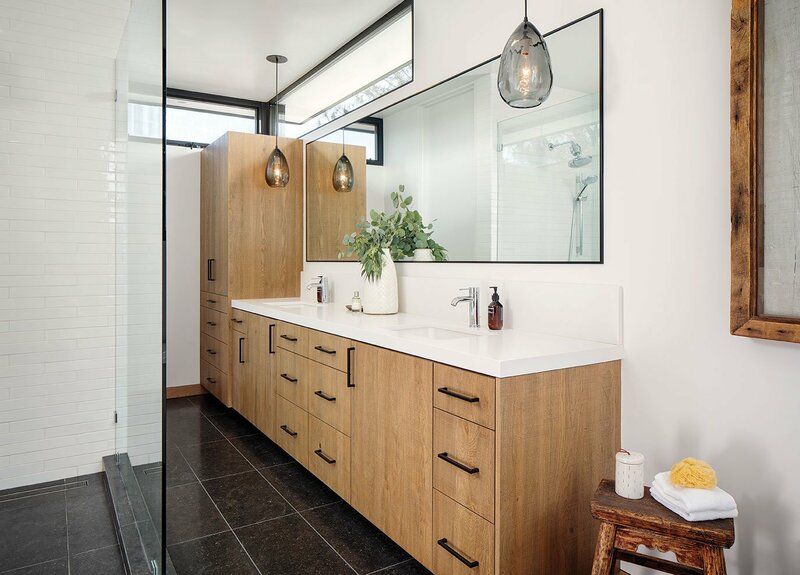 Erica made it easy on herself by sticking to a very neutral white, black and wood palette that she carried from the home’s exterior into the interior spaces. Erica’s first purchase was the trio of pendants over the kitchen island. When it came time to design furnishings, she consulted her friend and fellow designer Vanessa Schimmelpfennig, who helped her make fabric selections and more. 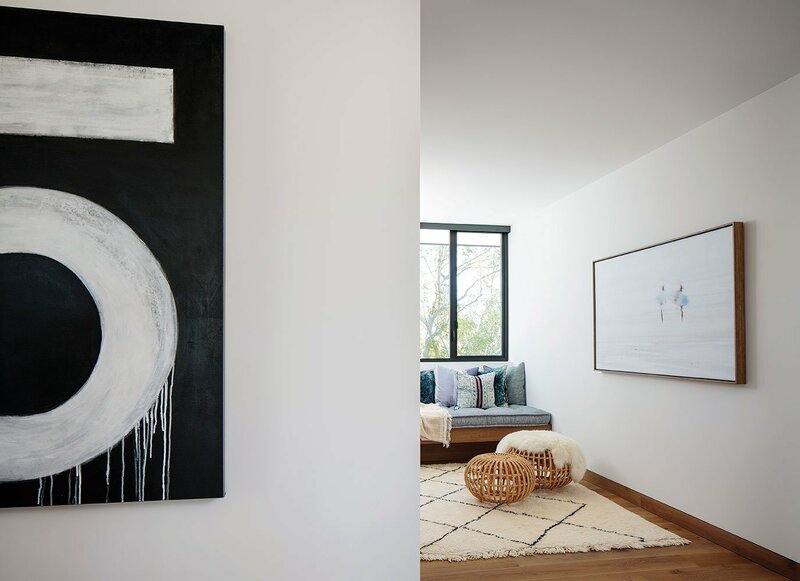 The pared-down palette easily welcomes the soft grays and blues Vanessa helped her introduce and serves as the perfect background for Erica’s bold art selections—a photo of her kids turned into black-and-white wallpaper to canvas one wall in her tiny home office (pictured at left); a giant “5” (for their family of five) that she worked with a friend and local artist to make to hang at the top of the stairs; an intentionally blurred Instagram photo of two surfers walking on the beach, which her hairdresser took and printed on canvas for her to hang on a wall by the upstairs nook seat; a three-dimensional wall hanging, which she commissioned a ceramicist to create, in the main living room downstairs; and a vibrant graffiti-inspired art piece in the media room. The nook next to the laundry room upstairs was a happy addition after the master bath was relocated. The twin-bed-size seating arrangement serves as overflow for overnight guests. The house exudes elegance and sophistication—without austerity—and is so livable in terms of design, finishes and furnishings. In a sea of soothing neutrality, the colors outside find a place to shine. 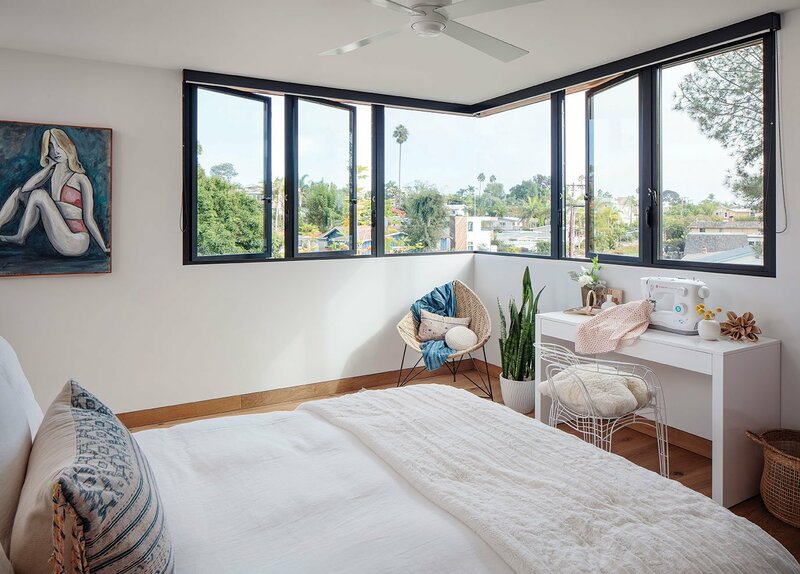 With window views that stretch all the way to La Jolla, the eye naturally goes to the blue of the ocean visible from the second floor; the green of the grass, hedges and citrus trees growing in the backyard; and the blue-to-yellow, orange-to-pink sky whose tint depends on the time of day and year. But despite the brilliant hues from outside, the real injection of color in this mainly neutral home comes from the inhabitants. Erica takes a moment for herself on the balcony off her master bedroom during the shoot. She originally thought she’d spend a lot of time out here, but the hustle and bustle of life doesn’t give her many opportunities to do so. Louie the pup is never far from her side. 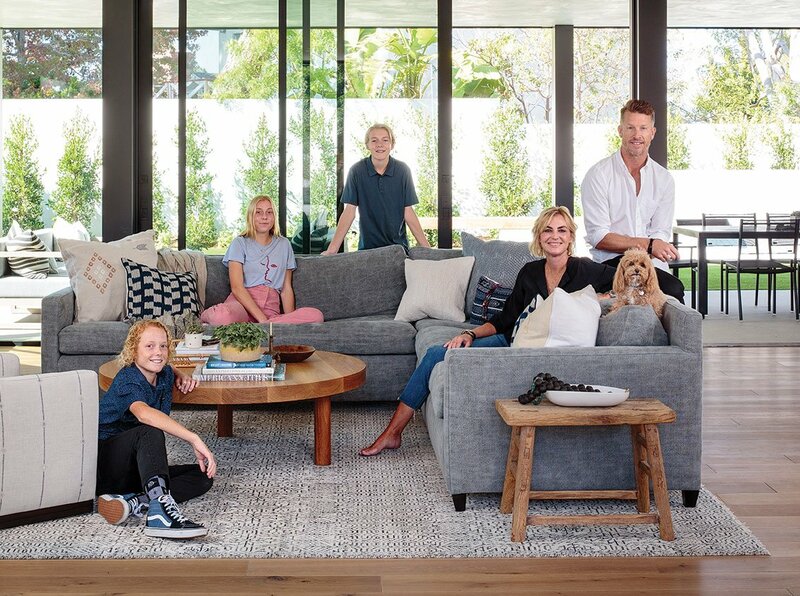 Whether the family of five is crowded around the TV cheering for their favorite team during a soccer match (the kids are avid fans and players, and John played in college), hosting a movie night for the neighborhood kids, or entertaining friends for dinner, the home is always full of life and people, and that’s exactly what John and Erica wanted. Considering a neutral palette or looking for ways to add style and character to an existing simply toned room or home? We asked Erica DeLorme for some advice. Read her 7 Tips for Designing a Neutral Palette here. © 2019 San Diego Home/Garden Lifestyles.